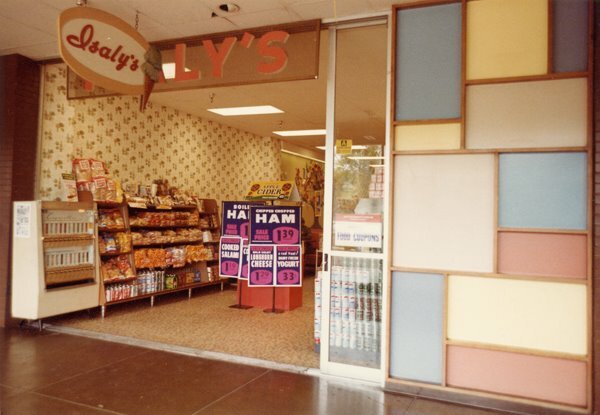 Vintage era shot of Isaly's, inside Northway Mall (now called the rather unwieldy, Shoppes at Northway). But this photo's definitely all about that beautiful, retrolicious multi-colored facade inlay wall deal--which reminds me of the totally cool one in the Brady Bunch house! I love this mall! More retro styling drives its appeal. Reading about the rich Isaly history at Wikipedia was very interesting and makes me want to check out the book that was written about the business. I second the sentiment that the Isaly company history was interesting. Almost makes me feel bad I've never heard of them. The retro storefront reminds me of 1950s kitchens with the juxtaposed pastel squares. My aunt had a kitchen that was very similar in style. The Shoppes? What is with that? Are these pretentious names the product of focus groups gone bad? The worst mall name I have ever heard was "Pavilions at Buckland Hills". This mall is outside of Hartford, Connecticut. The thing is, they had to change the name to "the Buckland Hills Mall" I think it is because nobody realized that "Pavilions at Buckland Hills" was a mall! So Sally Veauty Supply used to have stores "IN" malls? Interesting. For as long as I've known about the chain, they've only been located in strip centers in my corner of the country (Wisconsin).